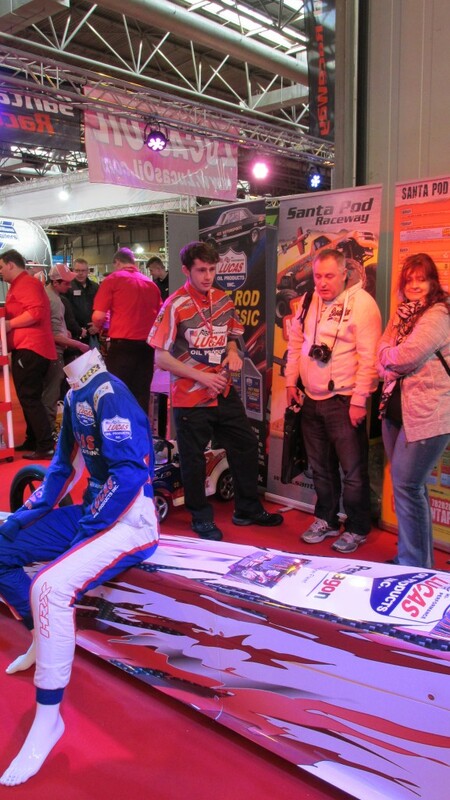 Brad Jackson Racing had Brad’s car on display at the NEC 14th-17th January 2016. 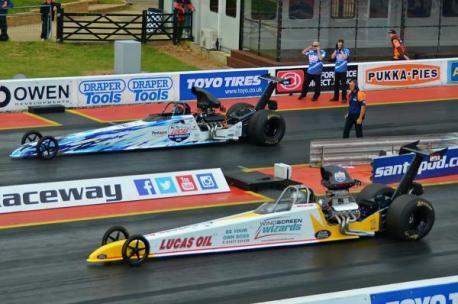 Lucas Oil had teamed up with Santa Pod Raceway and shared a stand which worked out really well with both parties gaining lots of crossover between product and display. It was a really positive event, the response the general public had to Brad’s car with many people saying that they knew what a Dragster was but had never seen one in “real life”, many people were really impressed with the look and quality of the dragster and they particularly liked the statistics of 0-60 mph in 0.87 of a second and 0-175 mph in 7.6 seconds. Brad’s race suit sponsor’s HRX are from Italy, Ago Alberghino, HRX’s owner had never seen a dragster before and want us to take the car to Turin in October for a motor show, we will keep you posted on that, I’m just trying to arrange the transport logistics of the trip at the moment! We are now busy preparing the car for the new season with a new wrap and team wear to be announced soon when the final design is agreed upon ! Watch this space for news. Speedster Brad Jackson proved an unstoppable tempest to win the Hillingdon Speed and Spares Apira Springspeed National Finals drag racing event in Shakespeare country..
Jackson dominated the holiday weekend meeting at the Shakespeare County Raceway at Stratford. upon Avon to now head the national rankings in the UK Super Pro Championship. On the first day of qualifying, the cloudy, cold and windy conditions generated a low track temperature which was reflected in the lower times. Wheel spin was an issue but Jackson posted his best time of 7.84 seconds on a 7.70 dial-in to earn seventh place . Conditions improved on the second day with the jet drier readying the circuit with Jackson’s first run of 7.79 on a 7.73 dial dropping him to ninth, But he followed that with a stunning 7.772 on a 7.77 dial, which clinched him second place to Rick Cook. His quarter-final opponent was Joe Stevens, a Super Pro event winner, but the North Yorkshire ace’s 7.78 on a 7.76 dial in beat Joe’s breakout of 8.55 on an 8.60 dial in. Next up was Barry Giles, a former Super Pro national champion and a 15-time event winner, Jackson was again on dynamic form a reaction split of 0.04 of a second reaction good enough to put him into the final. 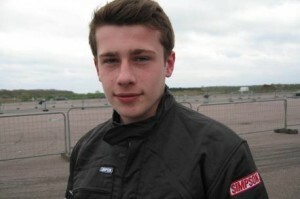 Three time junior dragster UK national champion Joe Kelly, in his rookie Super Pro season, stood between Jackson and victory. Jackson posted a 7.77 on a 7.76 dial with an 0.07 reaction time but it was never tested as Kellett’s car broke down for Jackson to claim a first Super Pro event win1 After also reaching the semifinals of the Festival of Power at Santa Pod in Northampton. He now heads the UK National Super Pro Championship ratings. Read The original article here …. NABURN speedster Brad Jackson is revving up for his next drag racing outing – the national championship’s round at Shakespeare County raceway. The May 2 meeting in Stratford upon Avon will hopefully see an extension of the solid form the 18-year-old enjoyed at the season’s opener – the Festival of Power at Northampton’s Santa Pod track. Helming a more powerful machine, Jackson, saw the first day rained off, so reducing the number of qualifying rounds. In his opening run, former Fulford School pupil Jackson suffered a severe slide to the right in the machine after it suffered a loss of traction, but the youngster controlled the car superbly to post a 16th place out of the 32 entrants. In round one, Jackson ousted Roy Wilding, a 38-year-old drag racing veteran, and then sped to a 7.69 second showing to topple Brian Pateman, an experienced Super Comp three-time champion with 13 event wins to his name. Jackson then set off within 0.04 seconds of the starting light showing to eclipse quarter-final opponent Roy Walker, to set up a semi-final encounter against Scott Hauser, winner of the Super Pro title for the last two years. Jackson had to be on his game and produced a stunning 0.003 reac tion time, but a mis-dialled time by his dad saw the race go to Hauser. 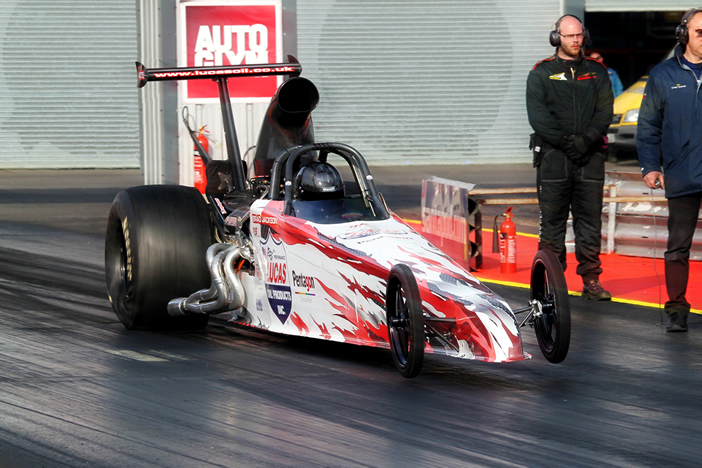 However, the reaction times over the Santa Pod track of between 0.003 and 0.074 seconds was a superb achievement for driver and back-up team to put them in fine fettle for the May 2 outing. BRAD JACKSON has proved himself in the high-octane cauldron of senior drag racing- at his first attempt. 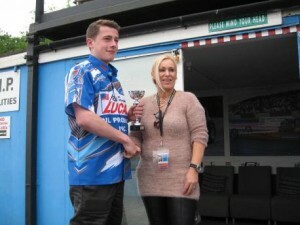 The Naburn-based teenager has wrapped up his debut campaign on the senior circuit with an excellent third place in the UK National Drag Racing Championship, which concluded with its final meeting at the Santa Pod Raceway, near Northampton. Europe. 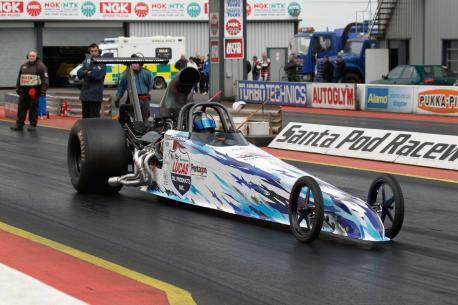 In The Final round the national –title at Santa Pod, Jackson qualified comfortably in 12th position out of the 23 competitors, who benefited by a crisp cool autumn – that helped the cars generate yet more horse power. However the second round of eliminations was far from as successful,Jackson made an uncharacteristic error and was red-lit by200ths of a second, which brought his involvement to an end .He and his team, whose team principal is his dad Wayne, were left with a nail-biting vigil to see if any other drivers would overhaul Jackson. That feat was achieved only by leading qualifier Rick Cooke, who knocked Jackson back down into third place in the overall rankings. But that did not spoil a superb debut season in a Super Pro car Jackson had set a new personal best time of 7.68 seconds at a startling speed of 175.01 miles an hour from a standing start over the quarter of a mile to afford another season-ending high. 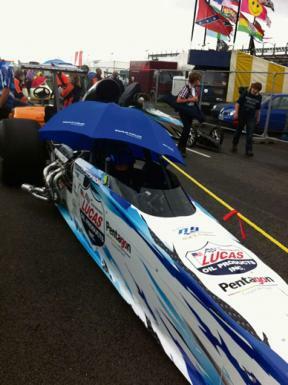 Brad Jackson Keeping Dry ! Tough of the track Brad Jackson might not have been zinging in the rain, but he was singing in the rain. 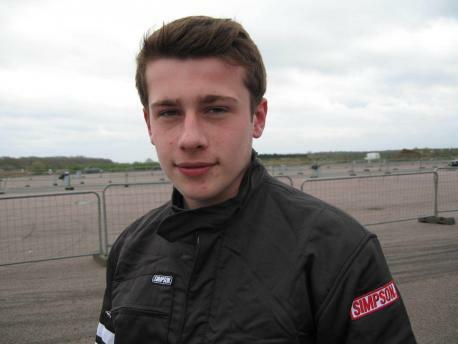 Appearing in his first European drag racing meeting as a professional, the 17 year-old Naburn ace collected valuable points from an event that was eventually washed out by the Bank Holiday deluge. A total of 47 cars vied for the 32 qualification places at the FIA main European event at the Santa Pod raceway, near Northampton. Lucas Oli driver Jackson’s first day of qualifying found him in an impressive 19th place after three. The next day, proceedings were hampered by intermittent rain all day leaving the youngster with just one more chance to improve. However, a timing error by his dad, and team principal, Wayne Jackson, dropped him to 25th place, though still well placed to make the final day’s racing. Jackson excelled in his first race, a fine reaction time of 0.04 of a second enabling him to beat experienced German opponent Marc Henney to book a place in the last 16. His next clash put him up against Nick Good Motorsport team-mate Dave Catton, who were in identical cars and not hampered by pre-set team orders. Yorks’S drag-racing ace Brad Jackson is a low-rider on a high, writes Tony Kelly. 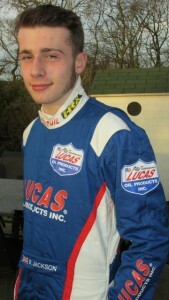 The 17-year-old remains in second place in the nationals championship in his first season as a professional driver. Qualifying in 13th place from 37 cars at the championships at the Santa Pod circuit near Northampton, he was then drawn in the head to head stage of the weekend event against team-mate and mentor Dave Catton in the sister car of the Lucas Oil/Nick Good Motorsport team. With no team orders in the first round of eliminations, a tight duel was eagerly anticipated. 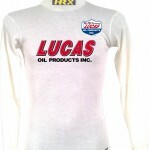 Catton, perhaps excited by the prospect of racing his protégé, was red-lit by two-thousandths of a second to hand an easy victory to Jackson in the first encounter of Lucas Oil dragsters. However, then the rains fell and the rest of the event was cancelled, though not without the York ace confirming his second place in the title race. Speed ace Brad Jackson is primed for maximum impact in the world of senior drag car racing. 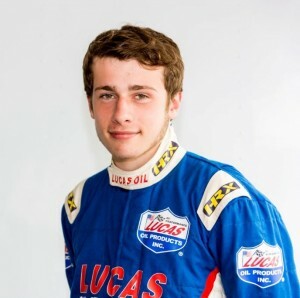 After an illustrious four-year career on the British junior dragster circuit, the Naburn-based teenager has joined the successful Nick Good Motorsport for the new season which starts this at the Santa Pod Raceway near Northampton. Jackson will helm the third car in the team, which is the only three-car Super Pro team in Europe. And after testing at the Santa Pod circuit this past week, the team are raring to go, agreed driver and his dad Wayne Jackson, who is the team principal. 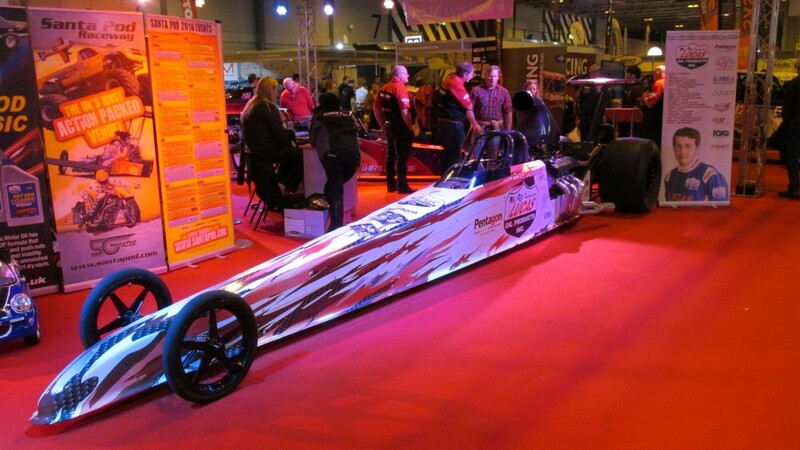 Said the 17-year-old driver, who is an apprentice motor technician for DM Keith Skoda in York: “I have competed in UK Junior Dragster class for the last four years. Said Jackson senior: “The car is all new and been fully prepared for the 2014 season by Nick Good Motorsport. 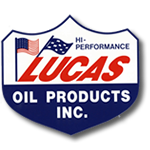 The youngster, who has sponsorship from Lucas Oil and American Oil, an automotive products company, will be seeking a similarly meteoric rise in the senior ranks as he enjoyed as a junior. Among his achievements over the last four years were winner of the 2013 FIA main event, fifth in the UK Lucas Oil National Championship 2012, winner at the Big Bang event in 2011 when he was also fourth in the UK National Championship 2011 and runner-up in the FIA European finals four years ago. 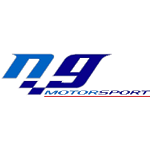 The Brad Jackson Racing Ltd team, which runs under the motto of “results, respect, excellence, integrity”, is completed by Jackson senior as team principal, Nick Good the crew chief, Cristiann Carlo and Dave Catton, the latter a mentor of the high-speed teenager. For those petrol-heads of a technical mind, the car is a Worthy Dragster from the United States, standing almost 20 feet long. It boasts a Big Block Chevrolet V8 Enderle methanol-injected engine of 9,258cc and capable of 940 bhp. Jackson junior’s licensing run is featured in a slo-mo video on his Facebook page on the item bradjacksonracing.com. That propelled the apprentice motor technician for York-based DM Keith Skoda, to the semi-finals, which he comfortably negotiated to set up a clash against Scott Hauser, the 2013 UK Super Pro champion. Though Jackson drove the USA-built Worthy Dragster car expertly, he lost out by a mere four-hundreths of a second. However, that advance to the last two showdown still nudged him into a challenging position for his next date with speed – the FIA European round back at Santa Pod over the Spring Bank Holiday weekend. So far a total of 47 entries featuring the cream of drivers from across Europe have been declared. But there are just 32 places available for the final rounds, so Jackson will face a stern test to attain final race qualification. Said Jackson senior: “Brad and the team had a great weekend at the Shakespeare track with Brad putting in several superb performances. AFTER just two outings as a professional Naburn teenager Brad Jackson is seeking a place at the summit of European drag racing. The 17-year-old, who this spring launched himself into the pro circuit after four trophy-laden seasons as a junior, has made a superb impact. 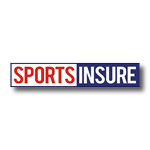 Jackson is currently in third position of the UK Super Pro championship after the opening two rounds, his latest success being at the Shakespeare County Raceway at Stratford-up[on-Avon. 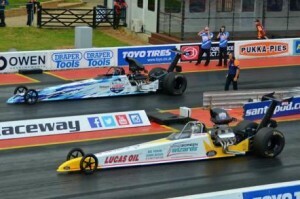 Following a points-gathering debut at the Festival of Power meeting staged by the Santa Pod track, Jackson – the focal point of the Brad Jackson Racing Team of which his dad Wayne is the team principal – surged to two more round wins in Shakespeare country.